High precision pressure transducer with an accuracy of 0.05% full scale including temperature errors over +10 to +40 deg C. Available in pressure ranges from 1 to 1000 bar gauge or absolute with a RS485 digital interface plus an optional USB, Bluetooth or RS232 converter cable for connecting to a desktop or laptop PC. The 33X digital pressure sensor incorporates silicon strain gauge sensing technology and digital characterisation techniques to produce a highly accurate pressure sensor over a wide temperature range. The optional USB, Bluetooth or RS232 converter cable enables the 33X digital pressure sensor to be used with the prog30 instrument programming software and the CCS30 data collection software. The live pressure reading can be measured or a data logging procedure can be set up for recording pressure data at set intervals. All data can be displayed in the form of graphs and printed out if necessary. The 33X digital pressure sensor also incorporates a temperature sensor which is located very close to the diaphragm in contact with the media. This temperature sensor is used to digitally correct the pressure sensor at different temperatures and it is also provided as an output signal via the RS485 interface. Is it possible to use the analog & digital signal simultaneously, and does the analogue output wire need to be split out? It is not recommended to use analogue & digital simultaneously due to cross-talk in electronics which will interfere with performance. Please let us know which is the best electrical connection option for recording 2 sensors simultaneously using a RS485/USB converter, i.e. 2 sensors will be wired to one converter? It is possible to connect two 33x sensors to one USB converter, and we would suggest specifying sensors with cable and connecting them to the K114 USB converter which has a screw terminal block for connecting cable wires. We would also suggest using the plug-in power supply for the K114 to provide adequate power to multiple connected sensors and not rely on the built-in USB power supply. Is it possible to program the sensor to average readings before outputting? You can set filters via the RS485 Modbus RTU protocol commands. Will this sensor send the pressure reading out to the RS485 within a data string? The sensor has a built-in RS485 interface which you can interface with directly instead of using the proprietary software and USB converter cable. You can configure the output using ModBus RTU protocol commands. I have been asked to order a 33x with a K104B USB to RS485 converter and USB cable part no. 309010.0010. I have a note on a previous order to use 309010.0076 instead for the USB converter cable part number, and it also says K114B rather than K104B, and mentions that it is only suitable for Series 30x/40x & LEO3 manometer, so no mention of 33X, so I just want to double check what are the correct codes before ordering? 309010.0076 is the correct part number, which is the K114B USB to RS485 converter and USB cable for use with a 33X that is one version of the 30 series pressure transducers. K114B replaced the K104B (part no. 309010.0010) which is now obsolete. Is the USB/RS485 cable included and can you show me a picture of the RS485 connection on board the device? The RS485 to USB converter box and cable is a separate extra option. The RS485 connects via the Binder connector (standard connector option) to the USB/RS485 converter box. All connectors are included for connecting the USB converter box and cable. The image below shows the digital & analogue wiring connections for the different connector configurations. How do you connect the digital interface of a Keller digital pressure sensor to a computer? The 33X includes a RS485 serial interface and the software protocol commands are provided in order to write your own software to talk to the sensor and retrieve data. If you wish to avoid writing a software program and prefer to use a USB or RS232 serial interface, the sensor can be provided with a USB or RS232 converter and software. The software incorporates the necessary protocol to communicate with the pressure sensor and application software for configuring and reading the pressure sensor. In addition to this you will need to ensure that a power supply is provided to the sensor. Most USB ports also provide a power supply output for the connected device which is sufficient to power the 33X. The RS232 converter comes with an AC adaptor plug to provide power to the sensor. 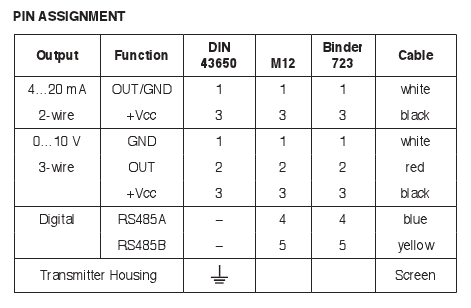 Pin 4 and 5 are reserved for the RS485 serial connection, and these can be connected directly to the K114B USB converter box and cable or the K107 RS232 converter cable. The sensor power supply is also provided by the USB or RS232 converter via pin 1 and 3. The blue wire is connected internally to the RS485A and the yellow wire is connected to the RS485B. the sensor power supply is connected to the black wire (+) and the white wire (-). All 4 wires can then be connected to the screw block terminals on the K114 USB converter terminal or the K102/K102I RS232 converter terminal which is then connected. Pin D and F are reserved for connection to the RS485 signal. Pin A and C is used to power the sensor. A cable has to be fitted to the military connector and then connected to the screw block terminals on the K114 USB converter terminal or the K102/K102I RS232 converter terminal. Pin 4 and 5 are reserved for connection to the RS485 signal. Pin 1 and 3 is used to power the sensor. A cable has to be fitted to the m12 connector and then connected to the screw block terminals on the K114 USB converter terminal or the K102/K102I RS232 converter terminal. Due to the insufficient number of connection pins available, the whole DIN43650 plug/socket assembly must be removed in order to the access the internal Molex connector for the RS485 interface. A special adaptor can be supplied which adapts the Molex connection to a Binder style connector to make it compatible with the optional USB or RS232 converter. I wanted a USB termination on the sensor in order to plug them into a USB hub? It is possible to wire multiple sensors to one RS485 to USB converter box so you only have to use one USB port on your computer. You will need the external AC adapter to power the converter box since there will not be sufficient power from one USB port. 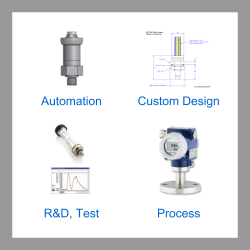 What type of digital interface does the 33X pressure transmitter have? The integrated digital interface is RS485 serial bus. If required the RS485 can be converted to RS232 or USB using the optional converter cable assembly accessory. On the 33x series pressure sensor, will I be able to get a 0..10V analog voltage O/P from the 5 pin binder connector cable along with the RS 232 data from the 485 to 232 converter simultaneously? It is possible to provide 0-10Vdc and RS485 output from the sensor simultaneously, but you will need split out the analogue output, since this is not wired to the RS232 converter. Also bear in mind that there is the chance of some small interference to the 0-10Vdc. On the data sheet of the Series 33X pressure sensor it advises that there may be some disturbance of the 4…20mA signal may occur during simultaneous communication through the RS485. 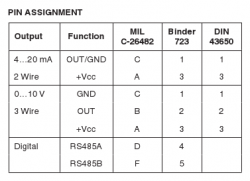 This is because RS485 uses a lot of current during communication, and this interferes with the 4-20A analog output signal which also draws a lot of current. In the case of the 0..10V output the interference is significantly less. I want to use 4 x 33X digital output pressure sensors and connect 2 sensors into a K104 USB converter box and possibly 4 sensors into 1 K104 as another option. Is it possible to use 1 x K104 USB interface as standard or is it necessary to purchase an extra cable assembly and power supply? If the 33X is supplied with an integral cable you can connect it to the K-104 (Part No: 309010.0008) with screw-type terminals. You can then take sensors and hook up all same colour / function wires together and connect them in the right place on the K-104 terminals. If the 33X sensors are likely to consume more than 20mA, then you can power the K-104 with a DC-plug (UK version Part No: 309010.0026). This solution works well for 2 into 1, but you may need to solder the wires together to achieve a 4 into 1 configuration. How do I read and write commands to the 30 series digital pressure transducer? Is there an coms protocol manual for using the RS485, RS232 or USB interface? The communication protocol for the series 30 handles the function commands to read or write values to the Xemics devices such as series 33X, 35X, 36XW, 36XS, 39X, 41X, 46X, DCX-22, LEX1, LEO3 and LEO Record. All of these devices communicate with the RS485 serial interface as standard. If the reading device is equipped with a RS485 port there is no need to use a coms converter box. If you intend to read the device using another serial interface standard, such as RS232 or USB, then you will need the appropriate digital interface converters to translate from RS485 to USB or RS232. The different interface converters have no influence on the function commands and therefore therefore the same protocol commands should be used for all three interfaces. I am interested in the 33X series high accuracy pressure sensor, but I would like an analogue output over a 700 bar pressure range. Also can I convert the signal in software from bars to other engineering units? The digital range of the 33X is fixed and calibrated to the full scale pressure range, which in this case would be 1000 bar. If an analog and digital output is specified (e.g. 0-10Vdc with a RS485 interface) then it will be possible to scale the analog output to any scaling below 1000 bar such as 0-700 bar. This will only improve the resolution of the analogue output but the accuracy will remain the same because it is tied to the standard calibrated range of 1000 bar range. Yes the bar reading can be converted to bar, mbar, Pa, kPa, MPa, mmHg, psi, mH2O, inH2O or ftH2O via the Read30 or CCS30 software which comes with the USB converter interface. Can I connect up to 6 individual 33X digital pressure sensors via usb to a computer and have them run simultaneously? You can run as many as 16 sensor channels (e.g. 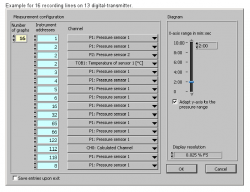 16 pressure or 8 pressure and 8 temperature) simultaneously using the logging software that comes with the USB interface option. It is possible to connect all the RS485 connections in series through one USB converter or you can use 6 separate USB interface connections. Are the different output types of digital, analog 2 wire and analog 3 wire for the Keller digital pressure sensors mutually exclusive or are they all available within one device? It is possible to have either one of the analogue outputs specified along with the RS485 interface, so it is possible to have RS485 and 3 wire 0-10Vdc or RS485 and 2 wire 4-20mA, but not all three. 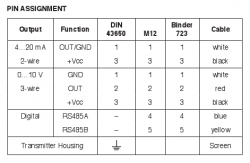 What is the keller part number for the RS485 to RS232 converter and ac adapter? The Control Center Series 30 (CCS30) software for reading, logging and analysing is provided with the USB or RS232 converter & cable accessory, and is also available for download free of charge. A pressure regulator imposes initial pressure on the circuit and I need to measure the pressure drop (timeframe of few seconds, max 20 sec). For this reason the device should be capable of acquiring many points per second to guarantee high accuracy? The update rate can be selected in the software, and the minimum is 30 msec for pressure only data with a 9600 baud rate. If I use the freeware, is the software able to record multiple sensors with readings spaced no more than 1 second apart? The software can handle up to 16 channels recording simultaneously and the minimum update rate is 30 msec with a 9600 baud rate. What is the sampling rate for the 33X sensor when used with the provided logging software? The 33X has the capability to send pressure readings at a rate of 1000Hz or interval of 1msec via the RS485 serial interface if required. If you are using the Read30 or Control Center Series 30 (CCS30) PC software to log measurements then the update rate is limited by the communication speed of the software. There are two baud rate settings possible when using the software; either 9600 or 115,200. If baud rate of 9600 is selected in the interface configuration window the minimum possible communication rate is 33Hz (30 msec period). If the faster baud rate of 115,200 is selected it is possible to achieve as high as 333Hz (3 msec period). However the 3 msec can be difficult to achieve if you have not got optimal software and hardware, and it may be difficult to achieve better than 16 msec with 115,200 baud rate. I need some software which can be connected to several pressure sensors working in parallel. What is the maximum number of 33X digital pressure sensors that can be used at the same time? You can run as many as 16 sensor channels (e.g. 16 pressure or 8 pressure and 8 temperature) simultaneously using the data recording software that comes with the USB interface option. You can also operate a few sensors from one USB interface, and in this configuration you will need an additional AC power adaptor, since there is not sufficient power supplied from the computers USB port to power many sensors connected to the same USB port. Is it possible to connect 2x pressure transducers to the PC simultaneously and would both results show on the same graph? It is possible to connect two or more 33x or PD33x digital pressure sensors via the optional USB converter. It is also possible to connect 2 sensors in parallel to one USB converter with the wire screw terminals version. In this configuration it is best to also have the optional plug-in power adaptor to boost the power supply to the USB converter, so you are not relying solely on the PC USB interface to power the sensor. If you are running the Control Center Series 30 software you will be able to select both sensor channels to display and log readings simultaneously. I want to log pressure on an injection moulding machine and plot a graph. We will be measuring hydraulic oil pressure. Ideally we want to produce a real time graph of the hydraulic pressure in the machine over a set time period. I am particularly interested in monitoring the very short high pressure peaks within the hydraulic system. The cycle time on the machine is 6 seconds and I would like to observe the pressure over that time period and check for a spike which may only be apparent for 0.1 to 0.3 secs. This may only happen once a day, therefore I would like to log the data for a whole day or two and then inspect the results. Is there anything in your range that can do this? The 33X plus USB/Rs232 digital interface comes with PC software for real time logging. It will log at a minimum rate of 30msec with the communications baud rate set to 9600. While connected to the PC you can leave it logging as long as you like at the minimum logging rate. Once the log run has been stopped, the data will be saved in a data file which you can access later to look for pressure spikes. We are connecting a Keller PR33X digital pressure sensor to a Laptop via the USB converter cable. We can find the CD which includes the driver but we cannot find the CD which includes the Read 30 / Prog 30 software for communication with the sensor and displaying readings. Is there anywhere where this can be downloaded from the internet? The Read30/Prog30 or the replacement CCS30 software which is compatible with many of the Keller digital output pressure sensing devices can be downloaded from the Keller software download webpage. 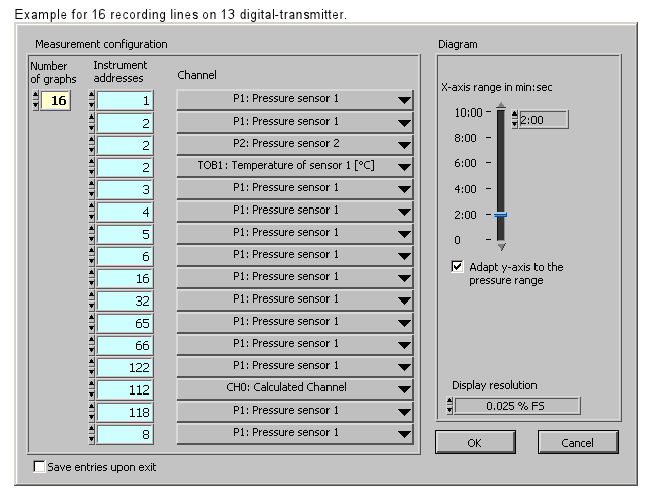 Do you have LabView drivers and example code available for the 33X digital output pressure transducer? Yes sample Labview drivers are provided bundled with the software, and the protocol commands for the RS485 are available via the RS485 communications manual. What is the fastest possible update rate for the 33X digital pressure sensor when using the RS485 coms interface? The 33X has the capability to send pressure readings at a rate of 1000Hz (1msec period) via the RS485 serial interface if required. If you are using the Read30 or CCS30 PC software to log measurements then the update rate is limited by the communication speed of the Read30 / CCS30 software. There are two baud rate settings possible when using the Read30 / CCS30 software; either 9600 or 115,200. If baud rate of 9600 is selected in the interface configuration window the minimum possible communication rate is 33Hz (30 msec period), if 115,200 it will be 333Hz (3 msec period). How many readings is it possible to continuously record with the READ30 software? There is no limit to the number of readings recorded by Read30, the only limitation is the PC memory. As a precaution it is probably best to save the data to a file at set periods to ensure no loss of data. Is it possible to display readings in cmH2O using the software provided with the USB converter interface for the 30 series digital pressure transducers? The Control Center 30 application software does not have cmH2O pressure units as standard, but there is the option to add one custom pressure unit in the pressure unit configuration menu if you know the conversion factor in ‘bar’ units. 1 cmH2O converts to 0.000980665 bar. Is there an option for having pressure range – 5 bar (gauge) or 6 bar (absolute) – available with model 33x digital & analog versions? Yes, you can rescale the analogue output of a 10 bar gauge range to 5 bar gauge. The same for a 6 bar absolute, but you would need a 10 bar absolute range to start with instead. You will also need the optional PC software & converter to rescale the analogue output yourself. The digital output will always be 10 bar gauge or 10 bar absolute, and cannot be rescaled. Please note you can have both digital & analogue output in one device, but we recommend only using one at a time to avoid cross-signal interference. We’re looking for a barometric pressure sensor that connects to a PC via a USB port? You can use the 0.8 to 1.2 bar absolute range version for measuring barometric pressure, and the RS485 to USB converter ot connect to a USB port on your PC. Do I need a 3 bar absolute or a 3 bar gauge pressure range, a zero will be done before applying the 3 bar pressure and then the pressure drop measured? You will need a gauge pressure range (PR33X) if your system is vented to atmosphere before applying the 3 bar pressure. In other words the sensor will read 0 bar gauge and not ~1 bar absolute before the pressure is applied. You will be able to zero the reading precisely before applying 3 bar if you wish via the sensor configuration software. An absolute range measures relative to a perfect vacuum, and if vented will measure ~ 1 bar. It is difficult to zero tare an absolute range (PAA33X) because you have to apply a perfect vacuum. What is the difference between PAA, PA, PR & PD 33X? PAA is for an absolute range, PA is for a sealed gauge range, PR is for a gauge range, and PD is for a differential range. Is it possible to have have a 33X pressure sensor with a lower range than 1 bar? The minimum base range is 0-1 bar, but if you have the USB to RS485 converter & software, you can re-scale the analogue output to a lower range to increase the resolution. Accuracy does not scale though, so it is fixed to the full base range. Alternatively the 41X series has lower base ranges. Is it possible to get the highly precise pressure transmitters (series 33X) with a 0-6bar range, 4-20mA out and 0.01% FS accuracy? The 33X is available with an improved precision of 0.01% for a standard 10 bar range, but only for the RS485 digital output. The 4-20mA output can be down-ranged to operate over 0 to 6 bar but the precision will be based on 0.01% of 10 bar = 10 mbar. It is also possible to build a custom range of 0-6 bar to improve the precision, and there would be an additional cost for this. I’m looking for a pressure transducer that can be connected via a USB cable to PC/Laptop. This pressure transducer will be fitted to our hydrostatic test pump with a range of 0 to 1000 bar gauge pressure. By doing this we hoped that it could give us a digital readout of pressure versus time which can be opened via microsoft excel or printed to make a pressure vs time graph. Also I will want to use the transducer with hydrostatic (water) and pneumatic (air) pressure medium. Would we be able to do this with the 33X? Yes, the 33X digital pressure transducer can be connected to a PC via a USB converter, and can measure up to 1000 bar. 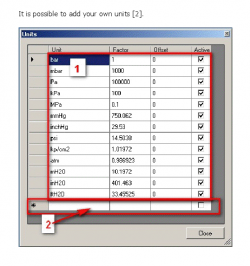 The 33X is compatible with the required media since it is all stainless steel/Viton and the software includes features to allow export of data to a spreadsheet. Can the 33X digital pressure transducer also show the temperature reading when connected to a computer? Yes you can measure temperature as well as pressure via the digital connection and log it simultaneously with pressure. The temperature sensor which is primarily used for compensating the pressure reading errors over the operating temperature range is accurate to 0.5 degC. The measurement point is just behind the isolation diaphragm where there is good thermal contact with the process. I’m planning on using the 33X for leak testing, and I am trying to determine the smallest change it is able to detect with a 3 bar absolute range, is this defined by the accuracy or the resolution values specified on the data sheet? For leak testing where you are only interested in a small change of pressure you should use the resolution rather than the accuracy. The uncertainty of the sensor follows a curve which sweeps over the pressure range of the sensor and therefore the uncertainty is much smaller between two readings that are close together. So when two readings are subtracted to determine the pressure drop, it can be assumed that the combined uncertainty of each reading is cancelled out. Therefore the smallest change in the sensor output detected by the signal conditioning electronics is what will define the limit leak detection resolution. Could we have a satisfactory result with a 0.01% accuracy if the sensor is used up to +50degC? It is not possible to provide 0.01% FS precision outside of 10 to 40degC compensated temperature range, so the standard accuracy of 0.1% FS over -10to +80degC is the best accuracy that can be offered for the the 33 X series up to 50degC. Is it possible to supply a Keller 33X with the improved 0.01% precision digital output and include the standard accuracy analogue output, or is it only possible to supply with a digital output? 0.01% precision on the 33X is only possible when it has just the digital output. What is the bit resolution of the ADC used inside the 30 series pressure transducer? The resolution of the XEMICS processor D/A converter used inside the 30 series is 16 bit. What’s the bandwidth of the 33X pressure sensor? The output resolution is 0.002% FS or 20 ppm. I am considering the use of the 33X high precision pressure sensor with a 4-20mA, but I need to be able to easily resolve small pressure changes of 1mbar with a 10 bar range, will it provide adequate measurement resolution? The 33X has a 4-20mA output resolution of 0.002%FS, therefore you will be able to detect a minimum change in pressure of 0.2 mb which is 5 times better than the change you would like to resolve. I am interested in a 1 bar absolute range and I notice that there is a version of the 33 X which has 0.01% FS precision over 10-40°C, would this be the best possible? This is improved precision of 0.01% for digital output only, however unfortunately it is only available for ranges 10 bar and above. The best option is 0.05% for the digital output over a compensated temperature range of +10 to +40°C. Is it recommended to use the external plug-in power supply with the 33X digital pressure sensor? The external power supply is only required for use with the RS232 converter to power the sensor, or with the USB converter if you have more than one sensor connected to one interface. The power supply is not needed if one sensor is connected to the USB converter, since he USB port on the computer will provide sufficient power. If using the analogue output separately you will need a suitable external supply in the range of 8-28Vdc. Will the sensor store any programed changes so that settings are not lost when power is cycled? The sensor has a non-volatile memory so configuration & calibration settings are not lost when the power is cycled. 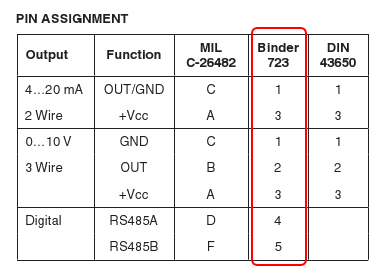 If a 5 pin Binder connector is provided, does it mean there is no battery and a specific supply circuit has to be used? There is no battery, this is a sensor only and has to be powered externally. If the USB converter box is supplied it will also provide power to the sensor. Do we need a separate power supply for this sensor or is the USB connection enough? If the USB port is powered then you can use it to run one sensor without problem, and possibly others added in parallel to the same interface. If you are planning on adding more than one sensor to the same interface it is recommended to purchase the external country specific power supply as well, which is a relatively low cost accessory. For the 0-5Vdc output version, what is the supply voltage for the sensor, and when using the USB interface do I need a separate supply voltage? The supply voltage is 8-28 Vdc. If the USB converter is connected to a powered USB port that should be sufficient to power the sensor. Is it possible to submerge the 33X digital pressure transducer? Yes there is an IP68 integral cable option for the 33X to allow you to submerge the device underwater similar to the one fitted to the 36XW submersible level sensor. 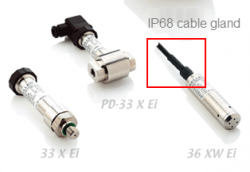 The standard electrical connection is a DIN or Binder plug and therefore there will be an additional cost and delivery time for the IP 68 submersible version. I want to use the 33X precision digital pressure transducer on seawater, is it compatible? The 33X is all stainless steel 316L (SS316L) and has a very thin isolation diaphragm, although SS316L performs quite well in seawater it is not ideal with such a thin diaphragm which will become pitted over time leading to failure altogether eventually. However, the 33X does have the option to manufacture the process connector and diaphragm from Hastelloy C276, which has very good compatibility with seawater. What is the diameter of the 33X sensor head? The body is 22mm dia, and the front part is 30mm dia. Our port is 1/4 standard piping thread, please advise if the head fits our port? The process fitting is a G1/4 male thread or otherwise known as 1/4 BSP P (British Standard Pipe – Parallel) male. Does the 33X high accuracy digital output pressure sensor have an oil-filled based sensor? Will mounting it in any orientation affect the accuracy or result in a bias of reading? The sensing element used for the 33X is an oil filled capsule with a silicon sensing diaphragm chip mounted within the oilfill. The orientation may affect the output very slightly but the pressure ranges for the 33X are not low enough for the g effect to be significant. 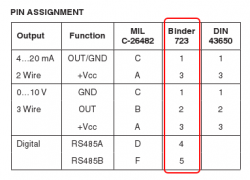 If the sensor is stationary any error caused by the orientation can easily be eliminated by trimming the zero reading via the RS485 coms interface with the provided configuration software. Please could you explain the difference between the K104 and the K104B USB data cable for use with the 33X series of digital pressure transducers. The K104B is intended for use with the standard electrical connector fitted to the 33X which is the Binder 723 series 5 pin plug. 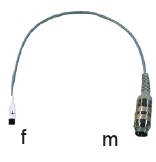 The K104B has a Binder connector on a short length of cable for easily connecting directly to the 33X. For more flexibility with distance during installation, it is possible to specify a 33X with a cable gland and an integral cable cut to any length instead of the Binder connector. 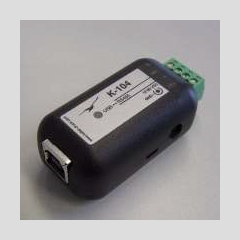 The K104B comes fitted with a terminal connector block for connecting individual bare wires that are provided at the end of the sensor cable. 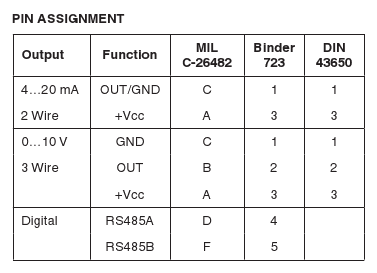 I want to fit 1 metre of signal cable to the 33X pressure tx, however I am unsure about how to connect to the Binder connector specified in the technical data sheet, is this something that could be provided? 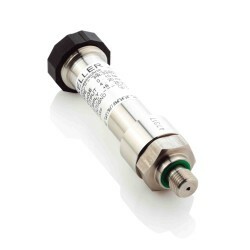 The Binder connector versions of the 33X digital pressure transmitter are supplied with a Binder mating connector as standard. You can fit your own signal cable to the mating connector following the pin wiring guide on the data sheet. Is there a limit on the length of a USB cable that should be used with the 33X digital pressure transducer? Can USB extenders be used so that the transducer is mounted 200 feet or so from the computer? The USB cable should be no more than 3 metres or 10 feet long. The sensor itself has a RS485 type serial interface, so you can run the RS485 to the USB converter box up to 800 metres or 2,625 feet. Does the ATEX approved version 33X cover the 0-10V output? It is not very common for a pressure sensor to include ATEX approval for voltage output, since the majority of hazard area installations utilise a 4-20mA current loop and therefore it is not economically viable for most manufacturers to invest the extra cost of developing and approving an additional set of electronics. However, where there is significant commonality between the electronics, it can be worthwhile incorporating different output types into the approval. This was the case with the 33X Ei high precision pressure transmitter, which along with the 4-20mA output option has also been ATEX intrinsically safe approved for the 0-10Vdc output option. Is it possible to adjust the output of this sensor when calibrating the sensor? Yes, using the PC software and USB converter it is possible to adjust the zero & span setting for the analog output and the zero setting only for the digital reading. I need a directly traceable calibration certificate to international standards for the 33X digital pressure transducer, is this possible? It is possible to supply the 33X with a UKAS certificate which is the highest certification possible in the UK, a DKD certificate which is the equivalent standard in Germany or an SAS certificate which is the highest equivalent swiss standard. What is the spec description for part number 233305.0105? It is a 33X with a 3 bar absolute range (PAA33X) with mechanical configuration to drawing number 80794. What is the specification for a PR 33X/80794.2, range 0-10 bar, P/N 233305.2191? Please select the options you require for the 33X High Accuracy Digital Output Pressure Sensor in your application and request a quote. Send us your enquiry for 33X High Accuracy Digital Output Pressure Sensor to get assistance with this product type.